The new ACG study began at NASA in the summer of 2011, and is still actively seeking healthy volunteers. ACG is the Alternate Compression Garment, compliments of Jobst and custom-fit to each study member. 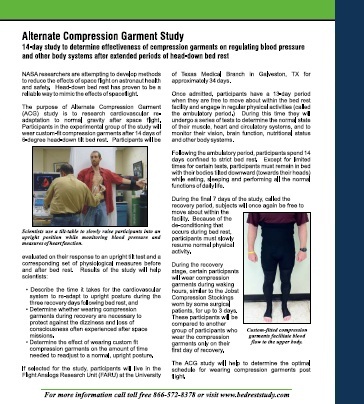 Read about the on the full study details on the HTSF Web Site: 14-day study to determine effectiveness of compression garments on regulating blood pressure and other systems after head-down bed rest.